This uniquely shaped structure was built in 1904. Originally known as the George J. Gould’s Palace Depot and described as “The most beautiful railroad building west of New York” by the Pittsburgh Post-Gazette. It serviced railroad passenger traffic until 1931 and used as office space until it’s demolition in 1954. Unfortunately, it was partially destroyed by two fires in 1946 which made it virtually unusable. Construction on this iconic hotel began July 4, 1834, and opened for business in June of 1836 as the Park Hotel. The building was designed by Isaiah Rogers who had designed Tremont House, in Boston, one of the first luxury hotels in the United States. Astor house was six stories tall and contained 309 rooms. Servant rooms were located on the sixth floor. It was one of the first hotels to use gas lamps and the gas was produced in the hotel’s own plant. Most citizens of this era were still using candles, in fact, a number of guests were asphyxiated when instead of turning off the gas to extinguish the flame, they blew it out causing their untimely death in the night. Along with modern gas lamps, there were bathing and toilet facilities for each floor in which water was pumped by steam engines. The hotel enjoyed a rich history of serving dignitaries as well as ultra-rich and famous members of high society. Andrew Jackson, Abraham Lincoln, James Garfield, James Polk, Martin Van Buren, The Prince of Wales, the Grand Duke Alexis, the Prince de Joinville, Sam Houston as well as Charles Dickens were known to have slept here. Despite a petition with over 5,000 signatures from New Yorkers who wanted to save the beloved hotel, everything within its walls was sold off and the structure was demolished in 1913, a mere 77 years after the cornerstone was placed. The Schiller Theater Building was designed by Louis Sullivan and Dankmar Adler of the firm Adler & Sullivan for the German Opera Company. At the time of its construction, it was one among the tallest buildings in Chicago. Its centerpiece was a 1300-seat theater, which is considered by architectural historians to be one of the greatest collaborations between Adler and Sullivan. The theatre opened in 1891as the Schiller Theatre and was originally projected to be used for German-language operas and cultural events. There were a few name changes throughout its history. Briefly called the Dearborn Theater from 1898 to1903 and settling upon Garrick Theater afterward. It was converted into a movie theater in the 1930’s and became a television studio in 1950 only to return to screening movies in 1957. 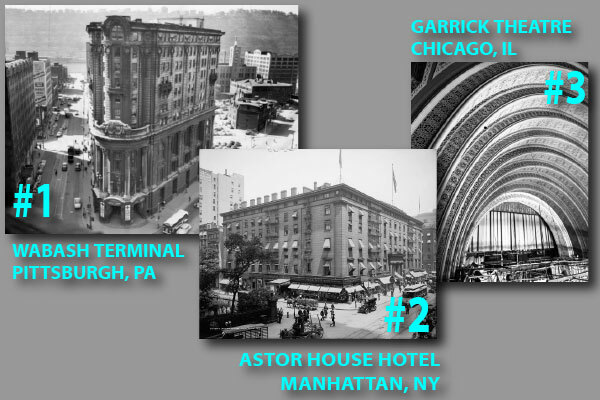 The Garrick was demolished in 1961 and replaced by a parking structure. It’s demolition instigated widescale preservation efforts from the native Chicagoans one of the first of its era. Fortunately, some of its artifacts and ornaments were salvaged during its demolition. One such relic, a portion of the arcade was integrated into the façade of The Second City’s theater in Chicago. Other great architectural masterpieces still stand amidst the steel and glass of today’s modern buildings. Their future remains uncertain, hopefully, many will be preserved and allowed to remain standing as a proud reminder of the architectural history of our great nation. ARE YOU AN ARCHITECT THAT NEEDS AIA AND STATE-APPROVED CONTINUING EDUCATION?